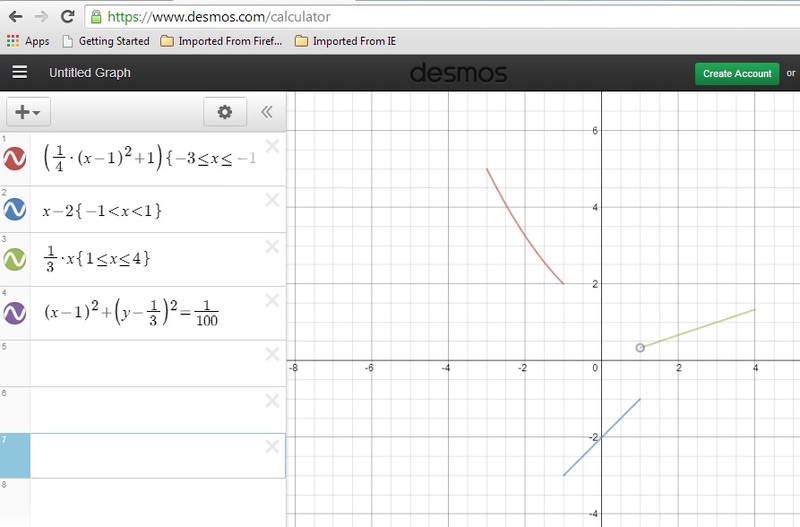 As I typed the function syntax into Desmos, I thought the editor was a little more user friendly than Geogebra. I typed <= and the editor automatically generated the less than or equal to signs for the restrictions on x. When I wasn't sure what to type, I browsed the examples of projects submitted by Desmos users found on the Desmos homepage. Ideally, I want to capture this graph and place it on an assessment. A photocopier may not pick up on the sections of the function on the graph given the lack of density (being able to make the segments and curves thicker). The way to make these curves denser was not immediately obvious to me. The circle centered at (1, 1/3) with radius 1/10 is my effort to place an open circle on the graph. To clean up the image, one thing I could try is modifying the restriction on x [for example, writing 1.2<=x<=4 instead of 1<=x<=4] so the user does not see the part of the function jutting into the circle shown at the left. 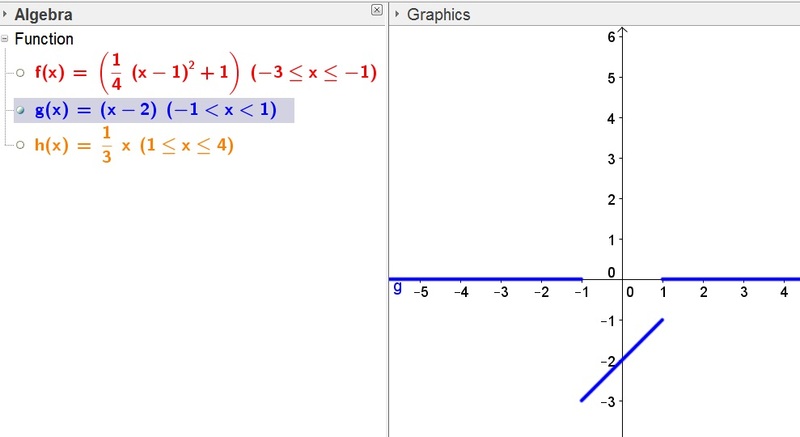 After making the graph in Desmos, I assumed I could use similar syntax to make the graph in Geogebra. Using similar syntax, I had a problem with the restrictions in Geogebra. Each function has a default y-value of 0 for values of x outside the restriction. Pictures are, after all, worth a thousand words... here are the three functions shown individually. Take a look at the x-axis. 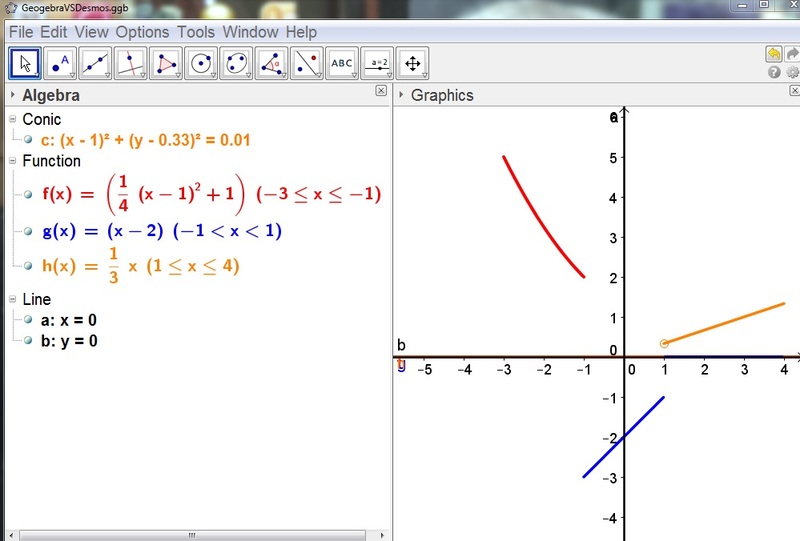 Here is the exact syntax I typed into the Geogebra input bar for each of the above pictures. 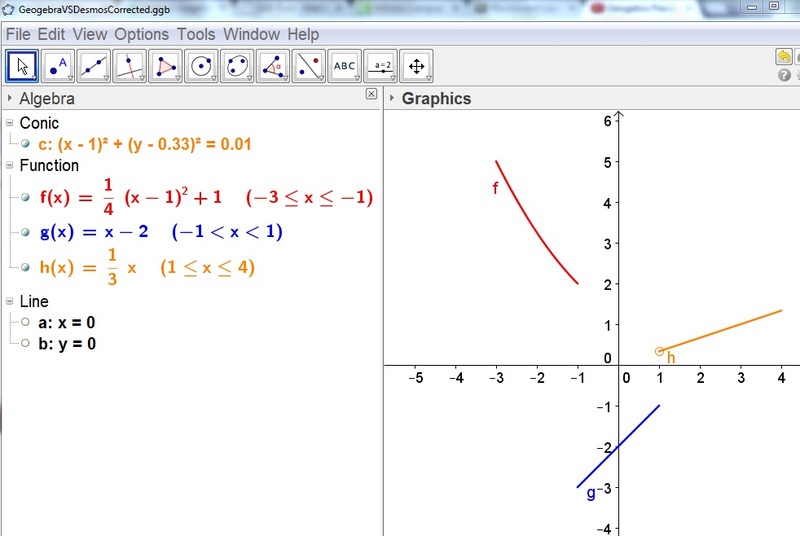 Below is an image of the corrected Geogebra graph using the appropriate If[ ] commands to define the rules f(x), g(x), and h(x). This approach eliminated the x-axis issues from the improper syntax I used at first. These graphs show some of the thinking I do day-to-day as a mathematics teacher trying to construct examples to display in class and problems to use in assessments. If somebody reading this has any advice that could help me become more effective with using Desmos or Geogebra for this purpose, please email me at saaberg@sbps.net or find me on Twitter (@ShelbyAaberg). **Update! See below for additional support on Desmos use. 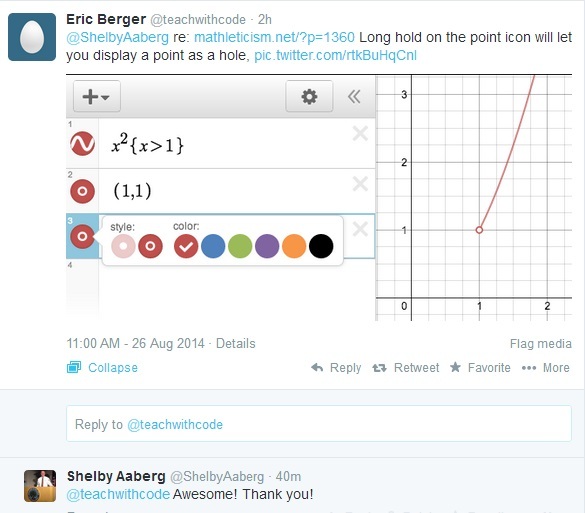 Thanks to Eric Berger (@teachwithcode) and Desmos.com (@Desmos). Here is the additional resource from @Desmos. Posted in Desmos, Geogebra, Teacher Resources, Teacher Think-Alouds, Technology, Uncategorized on August 26, 2014 by Shelby Aaberg.